The world is changing. The first century of the third millennium has seen exponential growth and advancement in almost all areas, and makes the last century of the second millennium look like a rusty old steam train by comparison. The ‘digital revolution’ is no longer a revolution. Practically anyone can publicise their outlook, whilst having access to a wealth of information at the click of a button. And this levels out the playing field in an unprecedented and unpredictable way. So how can anyone stand out? How can anyone gain a competitive advantage? How can anyone master more influence? The answer lies in coaching: a discipline that enhances performance by generating meaning through the art of relating. In Coaching for Impact, Vassilis Antonas brings together his dual expertise in executive coaching and psychotherapy to present a transformative, evolutionary approach. The book examines methodology, presence and fundamental skills and includes a new, innovative model of leadership. Antonas also uses Jungian concepts to address the coach’s internal disposition, supporting their evolution and transformation. 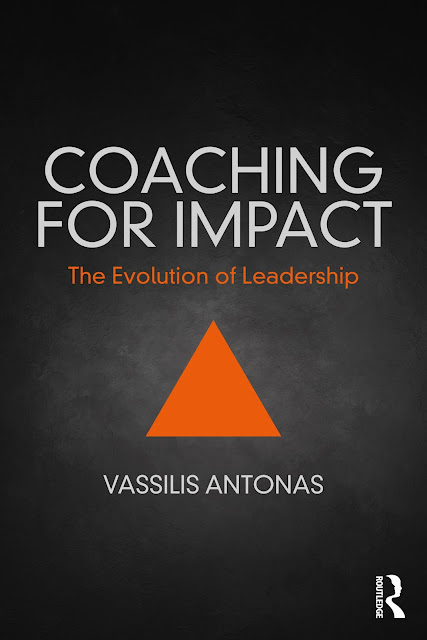 Coaching for Impact equips trainee and beginner coaches with an A to Z of executive coaching and engages seasoned practitioners to an uncompromised pursuit of excellence by pushing the boundaries of leadership coaching. It will appeal to executive and leadership coaches at all levels, including those in training. Αναρτήθηκε από Βασίλης Αντωνάς στις 2:09 μ.μ.